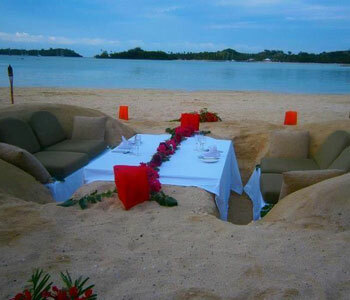 Have Dinner in the Sand! Check out Fiji's Adult Only Lomani Island Resort - Fiji Honeymoon and Romantic Getaway Location! How about a romantic dinner in the sand! We can arrange this special dinner for you near Fiji’s Lomani Island Resort, a lovely adult only Honeymoon resort in Fiji. For more information give us a ring or fill out the quote request form and we will get back to you with the details!